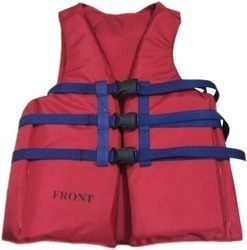 With our expertise in this field, we manufacture and supply a durable range of Life Jackets. The use of quality materials like tough and virtually water impenetrable polyethylene fabrics enable us to make sure our clients our assortment is compact life saving devices that prevent person from drowning in the water. These are presented in 2 types rigid and inflatable. Located in the coal capital of India, Abhaar Industries, a partnership firm, since 2009 are instrumental in manufacturing, supplying, distributing and trading of Lifting and Hoisting Equipment, Material Handling Equipment, Steel Wire Rope, Wire Rope Sling, Steel Chain, Chain Sling, Wall Winch and Hand Winch, Shackles and Eye Bolt and Turn Buckle, Industrial Safety Product, Life Jacket and Life Buoy, etc. All the products are having high durability, reliable, dimensionally accurate, and easy to fit, having compact size, extended life, precisely engineered, high efficiency, fine finish, in customized sizes with consistent performance and cost efficacy which are precisely tested and made of optimum grade materials. We offer all our products at most affordable prices.